Death in the White Mountains: Hiker Fatalities and How to Avoid Being One, by Julie Boardman, 2017. 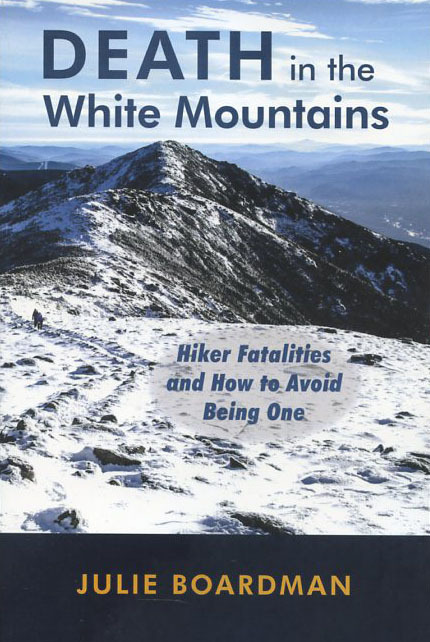 This exhaustively researched book chronicles each of the 219 hiker, climber and backcountry skier fatalities that occurred in the White Mountains from 1849 through 2016. The fatalities are covered by category, including hypothermia, falling, drowning, lighning strikes, natural causes and even murder. The author examines these tragedies with an eye towards identifying mistakes that were made, in the hope that future tragedies can be prevented. She concludes with "Six Lessons" to be learned by backcountry adventurers, and an analysis of "What the Numbers Tell Us.' (Example: 58 % of the fatalities occurred on the Presidential Range and 42% elsewhere) 206 pp., 6" X 9."